As enhancement to our permission marketing engine we provide with 1702 Hybris Marketing Cloud*) the ability to define multiple rules which exclude contacts from being contacted. BADI for onpremise & SAP Hybris Marketing Cloud. With this our customers get even more flexible & dynamic business rules which exclude contacts from being contacted. 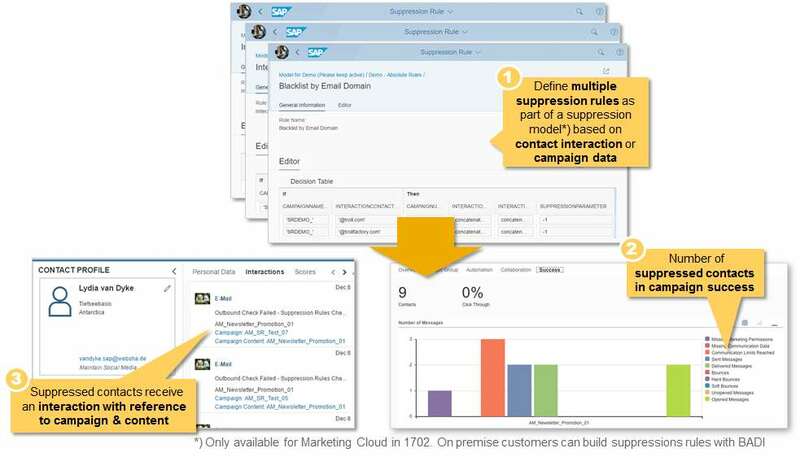 is it true that tue suppression rule engine is only available for the S/4HANA Marketing cloud? And if yes, why not for on Premise? the suppression rules user interface will at the start only be available in SAP Hybris Marketing Cloud (fka S/4HANA Marketing Cloud). In the on premise edition you can use our permission BADI to implement the same use cases and functionality. Reason is that Netweaver versions in on prem and cloud are slightly different currently. In the near future this will be in sync again which will then make also the UI available in on prem. it would be great if you could tell what might be the reason? if you have issues with the system please contact your internal project team first. They will create a ticket if needed. Could you tell which Badi you are referring to to implement the build of the suppression rules? I suppose Jan is referring BAdI CUAN_MKT_SUPPRESSION_RULES from Enhancement SpotCUAN_MARKETING_PERMISSIONS.